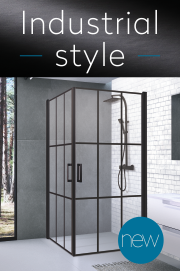 The spacious quadrangular shower enclosure that suits the spacious bathrooms. It is comfortable to clean. 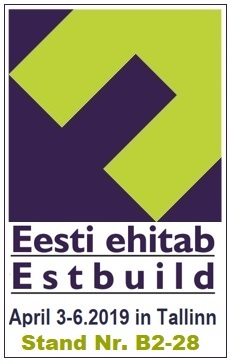 The orders of standard and non-standard dimensions are possible. 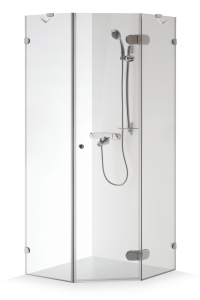 The rectangular frameless shower enclosure with 2 opening doors mounted in certain angle. The doors open outwards and inwards – it is comfortable to clean them. 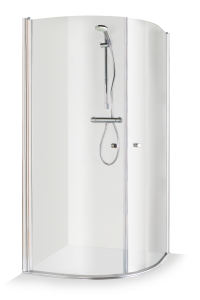 The frameless shower enclosure of the Premium class. The lifting hinges installed in this shower enclosure secure better tightness of the frameless enclosure. 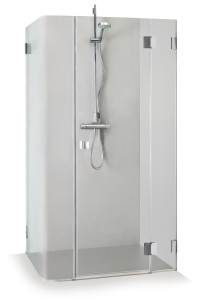 Frameless rectangular shower enclosure with additional side walls. It suits for spaces, where the coil pipe is nearby. The doors installed by angle may be opened inwards and outwards. 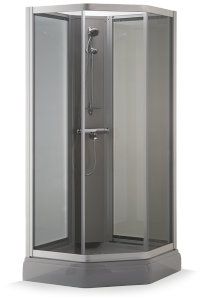 The pentagonal frameless shower enclosure with opening doors. 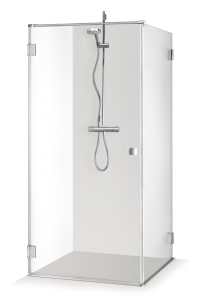 Compact and is included into the space of the bathroom perfectly. 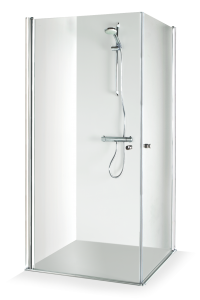 The rectangular frameless shower enclosure of the first class with auxiliary wall. It suits perfectly for restricted spaces. It is comfortable to clean. Quadrangular shower enclosure with sliding front doors. The minimal width of the façade has to be at least 1 meter, thus this enclosure suits spacious bathrooms more. 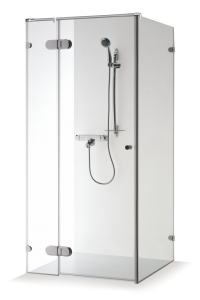 Quadrangular shower enclosure with sliding doors. 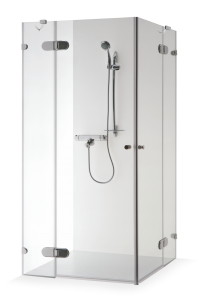 The doors are designed so that they were sliding at certain angle and thus the shower enclosure suits perfectly even the small spaces. Pentagonal shower enclosure that uses the space especially economically, with sliding doors. It has arched glass opening doors, thus it is comfortable to clean it. 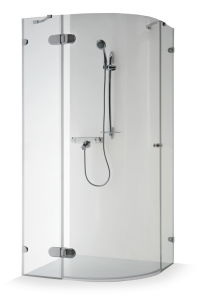 It is necessary to provide space for comfortable opening and closing of the doors of shower enclosure. 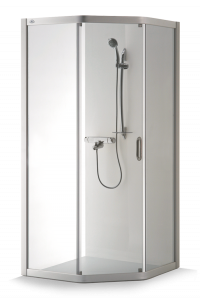 The rectangular frameless shower enclosure with two stable walls. 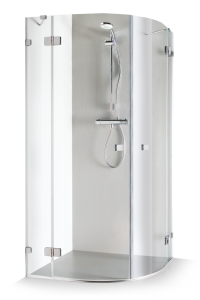 This enclosure may be compactly mounted by the coil pipe. The glass bent by high angle and the magnet technologies in hinges make this enclosure special. It will become the adornment of your bathroom without any doubt. 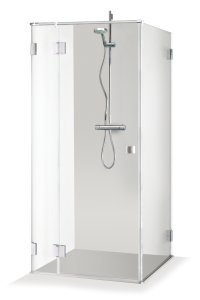 The rectangular shower enclosure with specifically bent glass and magnet technologies in hinges for more spacious bathrooms. The glass bent by high angle make the enclosure’s forms “softer”. 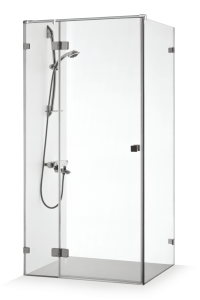 Easy to mount and use rectangular shower enclosure. 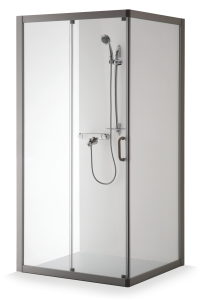 When the enclosure is not used, the doors may be bent to the wall inwards and outwards, thus the bathroom seems more spacious. The rectangular enclosure with fittings of the highest quality. 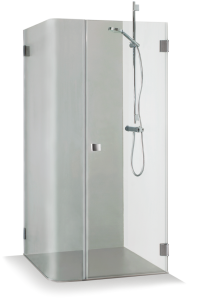 The non-decomposed walls of the enclosure allow maintaining the enclosure clean with more ease, and it seems that the enclosure simply “disappears” in the bathroom. 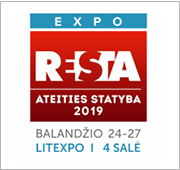 The rectangular enclosure of the highest quality with 2 stable walls. It suits perfectly for the premises, which have less space for opening of the doors. The example of Scandinavian practicality and esthetics. 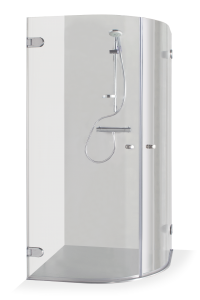 Nice bend of glass; it is possible to bend the enclosure’s doors inwards to the mixer when it is not used. The maintenance is easy. The wide arched doors of this enclosure not simply look nicely, but also suit to majority of bathrooms. It is possible to open the enclosure’s doors comfortably in smaller premises, as well. A very practical solution for small bathrooms – the shower’s door may be attached to the wall when the enclosure is not used. More space and comfort besides, the water mixer may be arranged in usual place. 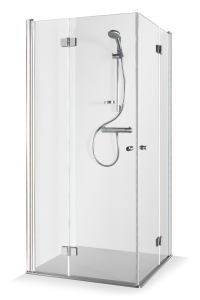 The shower enclosure of “clean” forms. 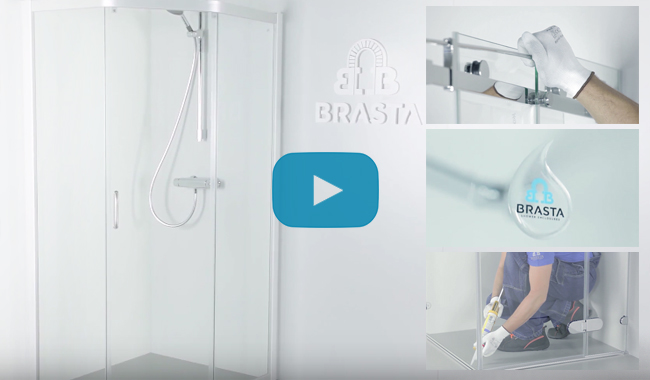 When the shower enclosure is not used, its doors may be bent comfortably to the room’s wall and thus the bigger space of shower room is formed. 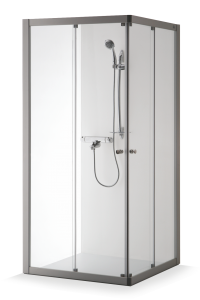 The doors of the shower enclosure open to both sides.